Game publishers are frequently shocked at the high quality that short-run digital printing can achieve these days. The reason the quality gap between short-run, digital printing and high-volume printing has closed (assuming you're printing with the right digital printing equipment) is that the actual print process used is not all that different. If you'll spare a few moments, we can level up your expertise on how this digital printing stuff works. Before OneBookShelf started providing print services for books and cards, I misused terms like "offset printing" and "digital printing." I was among the number of people in the game industry who didn't always get these terms quite right. So let's first make sure we have some terminology straight. Nearly all digital printing is done by offset printing. The term "offset printing" simply refers to any printing method where the image is applied from an imaging surface to an intermediate surface and then to the paper. For most high-volume, commercial print presses, this means that water and ink are placed onto an image cylinder (or plate cylinder) which then transfers the ink and water to a rubber "blanket" (or offset cylinder) which then makes the impression onto the paper itself. Large presses do their offset printing using a method called offset lithography which works because water and ink don't mix, and the image plate that is wrapped around the image cylinder can be photographically treated to make only parts of the image plate receptive to holding ink. And as you may already know, color offset presses normally work by having a set of rollers for each of the Cyan, Magenta, Yellow, and blacK (CMYK) colors which can combine to form any color on the final printed paper. This CMYK process differs from the Red, Green, Blue (RGB) process used on monitors and televisions to mix and form colors. The difference for digital presses vs lithographic presses is not the offset process; both types of presses are technically offset presses. 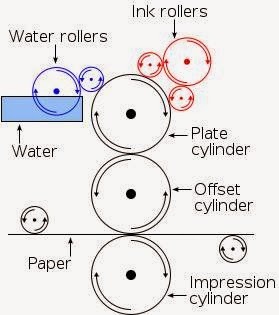 The difference is that digital presses use different processes for both 1) placing the image on the image cylinder and 2) placing ink (or toner) on the image cylinder and then to the offset cylinder and to the paper. Instead of the lithographic process, digital presses use some variation of electrophotographic printing. The image cylinder is electrically charged, and then a laser writes the image negative onto the cylinder changing the electrical charge where the image will go. As the plate then passes through toner, the toner is electrically attracted to stick to the plate based on the charged or uncharged areas of the plate. It's like one big Etch a Sketch using electrostatics/magnetism to decide where the ink goes. In lithographic printing, the image plate is burned in once photographically and then mounted on press and the same image is rolled out thousands of times. With digital presses, the image is written to the image cylinder by laser or LED anew with every roll which means each sheet of paper passing through the press can get a different image. So why do some digitally printed items look like photocopies and some look indistinguishable from lithographic press work? Not all digital presses are the same. Dry toner can clump causing banding or lines in areas of heavy, solid color. Dry toner is fused after being applied to paper rather than going into the paper through pressure. Dry toner sits on top of the paper, unlike liquid ink that saturates into the paper and allows properties of the paper to come through. This is why dry toner has a high-gloss sheen even when printed on matte paper stocks. Dry toner does not reproduce true color tones as well in CMYK color combination. Dry toner is more prone to color fading. While digital printing on machines using dry toner is getting better, it still does not match the quality of lithographic press work. The exception for digital printing are presses like the HP Indigo which use liquid toner instead of dry toner. This liquid toner still adheres to the image cylinder by electrical charge, but the Indigo press then uses a rubberized blanket (offset cylinder) more like a lithographic press. When the liquid toner hits paper, it sinks into the paper instead of sitting on top of the paper as a baked-on layer of fused, dry toner. This allows a more faithful reproduction of matte finishes like you see on most lithographically-printed cards. Of course in any printing process there are many factors that determine the final quality of the output: the print files, the pre-press processing, the card stock selected, press work, coating, cutting, etc. At DriveThru, all of our cards are printed on HP Indigo presses, and we use card stocks like Arjo Wiggins Matte. These are two of the larger quality factors which allow us to produce cards that customers can shuffle right into their collection of cards printed on large lithographic web press runs. This is especially important as we do community card creators for games like the Pathfinder Adventure Card Game, where customers will need their custom-created cards to shuffle seamlessly into their existing deck collection so they cannot tell the difference between cards printed digitally vs lithographically during play. I shuffled a few of the your newest cards into a pile with some Carta Mundi cards, and asked a couple of people to divide them into DriveThru and Carta Mundi piles, and nobody did it correctly. Good job. Then we know we're at the quality level publishers need to see before they include digital printing in their publishing toolbox.